In 2016, Hannah Claire Somerville decided to embark on a year long embroidery project. She worked inside a single hoop, using cotton embroidery floss and stitched every day for a year. She documented her work on Instagram. Sara Barnes wrote about Hannah's project on her blog, Brown Paper Bag and encouraged her readers to participate in the challenge in 2017. I heard about it and was intrigued. I decided to participate and have created my own rules. I am stitching on a single piece of gray even-weave linen. I wanted my piece to grow organically throughout the year, and to include a variety of stitches and colors. I wanted the piece to include different types of embroidery, since I have equal experience with work on counted grounds and free embroidery on other surfaces. I am using primarily DMC cotton floss for the stitching. 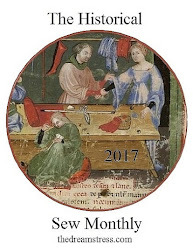 In order to provide variation in my color choices, I am using the daily colors assigned in Llewellyn's Witches' Calendar for 2017. I am trying to select a different stitch or variation each day, although that may not last. Some sections include layers of stitching, that build on each others, others are independent. I am using a hoop and am focusing on filling the interior of that hoop before moving onto other portions of the fabric. My daily progress is posted on Instagram, @Needlewoman99. I am also sharing weekly progress pictures with the 1 Year of Stitches group on Facebook. You can find work by other participants in the Facebook Group or by using the hashtag #1yearofstitches to look on Instagram. Progress on my 1 year of stitches project after 14 days, January 14, 2017.